Toyota says that, excluding pickup trucks, the RAV4 is the best-selling vehicle in America. Not the Camry sedan, as has been true for years. The RAV4. And now that the completely redesigned 2019 Toyota RAV4 is going on sale in December of 2018, the consumer migration to crossover SUVs shall soon be complete. It’s not hard to figure out why SUVs are popular. They’re big boxes on wheels that offer all-wheel-drive for winter weather, they hold four or more people with ease, they’re easy to get into and out of, and the tall driving position provides better forward visibility. An SUV’s practicality is irresistible, and there are really only two downsides to owning something like a RAV4: it is more expensive and less efficient than, say, a Camry. Life is full of trade-offs, isn’t it? Having spent the majority of a day driving the new 2019 RAV4, which is improved in nearly every way, I’d say Toyota is narrowing the value gap between a car and an SUV, if not completely closing it. My two different RAV4 Adventure test vehicles were identically equipped except for paint color, and came to an estimated $36,000. Granted, you can get a loaded-up Camry XLE or XSE for that kind of cash, but it won’t be nearly as versatile as a RAV4 Adventure. When it came to the RAV4’s styling, Toyota took design inspiration from its truck lineup. 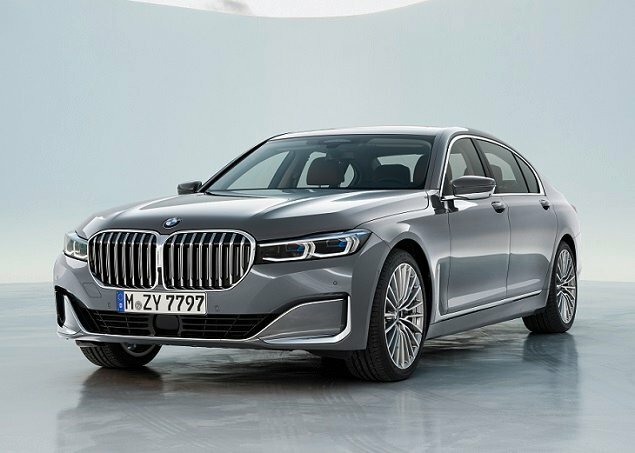 Bolder forms, chiseled flanks, and a more aggressive appearance represent a clear departure from the previous model. In Adventure trim, which has extra rugged cues and bigger wheels, the RAV4 is particularly appealing. Inside, the RAV4’s interior retains its utility and user-friendly layout, but adds a dash of design. Adventure trim includes orange highlights throughout, helping to underscore its mission as the off-road-capable RAV4. Driver’s seat comfort is good, and versions with SofTex leatherette can be fitted with heated and ventilated cushions. A heated steering wheel is available, too, along with rain-sensing wipers with a de-icer system. You can even get an oversized sunroof with the new RAV4. Clearly, this SUV is ready for any kind of weather. The front passenger’s seat lacks a height adjuster, but because the seat sits high off of the floor, this isn’t an issue. Rear seat passengers will enjoy adequate rather than ample room, but new air conditioning vents are helpful. Cargo space behind the rear seat is about the same as it was before, offering a minimum of 37 cubic feet of volume. Toyota had not finalized maximum cargo numbers as this review was published. The 2019 RAV4 lineup includes gas and gas-electric hybrid models. Gas versions come in LE, XLE, XLE Premium, Adventure, and Limited trim levels. Hybrid versions are offered in LE HV, XLE HV, XSE HV, and Limited HV trims. All-wheel drive is optional for gas models, except the Adventure, in which it is standard. All RAV4 Hybrids are AWD. In addition to numerous standard safety technologies and a new family of infotainment systems, the 2019 RAV4 is the first Toyota equipped with a new Digital Rearview Mirror. It projects an unobstructed camera view of what’s behind the RAV4 onto the rearview mirror, and if you prefer a normal rearview mirror experience you simply flip a switch. Another new feature for the redesigned RAV4 is Qi-compatible wireless device charging. Most RAV4s also have an upgraded panoramic-view reversing camera, and a 360-degree surround view camera with perimeter scanning capability, front and rear parking sensors with automatic reverse braking, and a hands-free power tailgate are available. Controls are logically laid out and easy to reference and use. For example, when you turn on the seat ventilation system, and the indicators are green instead of orange, which is helpful. Storage areas are plentiful, and the dashboard shelf is particularly useful. 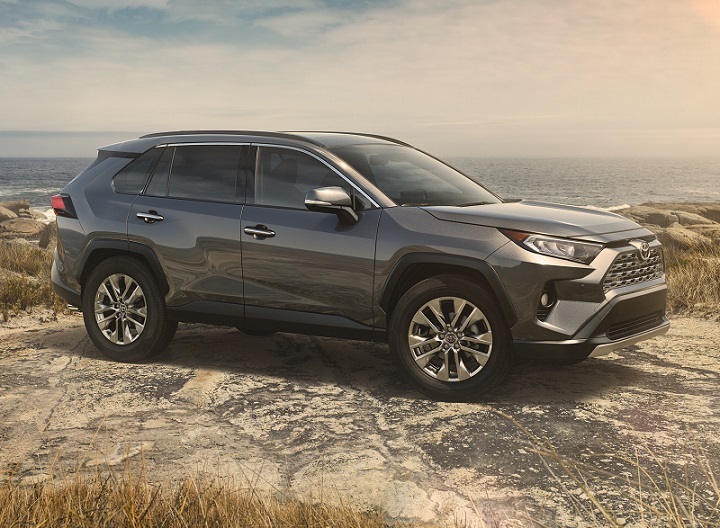 Standard equipment for all versions of the 2019 RAV4, Toyota Safety Sense 2.0 equips the SUV with important driver assistance and collision avoidance systems. They include new functions like low-light pedestrian detection, cyclist detection, road sign recognition, and Lane Tracing Assist. When the adaptive cruise control is on, Lane Tracing Assist centers the RAV4 in the lane of travel, and can even get the SUV around bends with little in the way of driver effort. It works well, and the adaptive cruise is a smooth operator. Safety Connect subscription services are standard on all RAV4 trims, too. It includes automatic collision notification and SOS emergency calling, and is free for the first three years of ownership. That’s generous. Additionally, Remote Connect service provides alerts related to speed, curfew, and geographic boundaries, and provides a find-my-car function. All of these are useful to parents of teenaged drivers. Remote Connect is free for the first six months. A family of next-generation Entune infotainment systems provides a list of impressive features in every RAV4. Apple CarPlay with Waze integration is standard, as is Siri Eyes Free, Amazon Alexa, and Google Assistant compatibility. 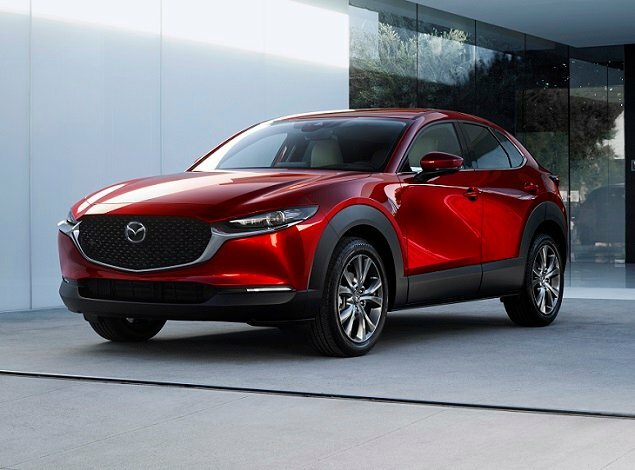 Standard equipment also includes a Scout GPS Link connected navigation app, along with Wi-Fi Connect with free connectivity for up to 2-gigs of data or six months of ownership, whichever comes first. Upgrade to the mid-level or top versions of Entune, and the RAV4 adds things like SiriusXM satellite radio, more USB ports, more subscription service packages, larger touchscreens, better reversing cameras, and embedded navigation with superior voice recognition technology. You can also get an impressive JBL premium sound system with Clari-Fi music restoration technology. It sounds great, and is worth the added cost if you’re an audiophile. Equipped with a 203-horsepower, 2.5-liter 4-cylinder engine, an 8-speed automatic transmission, and Toyota’s new Dynamic Torque Vectoring all-wheel-drive system, the RAV4 Adventure is a little pudgy at 3,615 pounds. 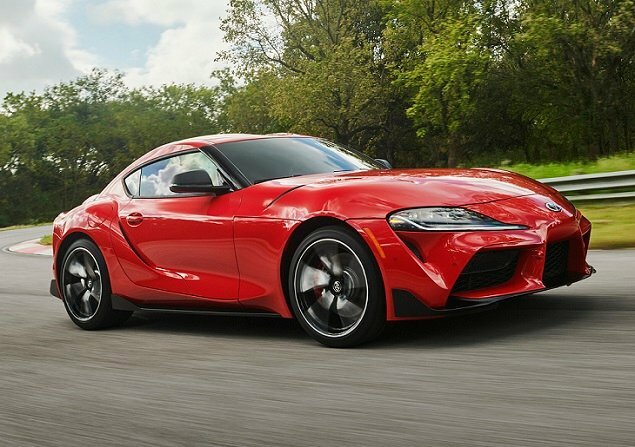 That means acceleration to 60 mph takes about 8.5 seconds, and is unaccompanied by the swell of torque that a turbocharged powerplant would deliver. Turbos, though, tend to guzzle gas when you actually use them. Toyota says a RAV4 Adventure should get 27 mpg in combined driving, and during my half-day behind the wheel the test vehicle returned 26.4 mpg. Featuring a longer wheelbase and wider front and rear tracks, and sitting on a new global vehicle architecture that is often credited with making Toyotas more enjoyable to drive, the new RAV4 certainly feels more dynamic than before. However, this particular test drive did not include roads that might reveal significant ride or handling flaws. What I did discover is that the RAV4 suffers more road and wind noise than is expected in a new-for-2019 redesign, and that the new rack-mounted electric steering is terrific. Acceleration is fine for most circumstances, though the transmission takes a moment or two to kick down when in Eco or Normal mode. Switching to Sport mode helps to solve that. Toyota also set up an off-roading course designed to highlight the RAV4 Adventure’s 8.6 inches of ground clearance, torque-vectoring AWD, and hill descent control systems. It’s more capable than expected, approaching if not quite matching vehicles like the Jeep Compass Trailhawk and Subaru Forester when the going gets rough. Despite its age, the 2018 RAV4 is winning the popularity contest. That suggests that this new-and-improved 2019 RAV4 will continue to dominate the small SUV segment in terms of sales. At the same time, Toyota has improved the RAV4 in the ways that matter to most consumers. It looks better, it drives better, it is safer, and it is more sophisticated in terms of its technology. Plus, in Adventure trim, it demonstrates decent off-roading capability.